I’m currently training to become a Mission Pilot with the Alaska Civil Air Patrol. Essentially, they’re the ones who fly the planes during search and rescue missions, and since the entire crew depends on them for the safety of the flight and for the precision of accurately locating and flying over the search areas, they need to be both competent pilots and well versed in navigation. At 70 hours, even though I don’t have enough time in the airplane to qualify for MP status yet, it makes sense to go ahead and practice what I’ll need to know, so that when I do reach that mark, I’ll be prepared. I went up this past Sunday with another CAP pilot and practiced flying a grid that we had picked out in the hills near Skwenta, which is about 50 miles northwest of Anchorage. I had not yet been out to Skwentna, and so I was keen to go somewhere new in the airplane and practice my cross country route finding. Flying out there in the 172 was fairly straightforward, although we did encounter some light chop on over Flathead Lake on the east side of Mt. Susitna. The weather was mostly clear, although there was a definite low pressure system moving into the Anchorage area. Even though the plane was equipped with a GPS, I tried to rely on pilotage and compass headings to get me out there. Beyond Mt. Susitna, it was all new terrain for me, which is always exciting. All the of the mountains of the Alaska Range were out, and our heading took us more or less right towards the impressive Kichatna Spires, which loomed closer with each passing mile. To the north, Foraker, Hunter and Denali also held court in full view. As we approached the junction of the Yenta and Talachulinta Rivers, I started looking for the airfield, which is really just a 3,500′ gravel strip that sits down among the trees. It was hard to spot at first, but eventually I saw the runway, fell into the pattern, and came around for the approach. It was actually my first time landing at a field that didn’t have an ATIS or AWOS broadcast, so I had to rely on the wind sock and the feeling of how the aircraft handled on final approach to tell me what was going on outside. The Cessna bounced and rocked a little bit on final, but as I descended and cleared the trees at the edge of the threshold, things smoothed out. I touched down on the soft, well maintained gravel, remembering to hold the nosewheel off and let it come down slowly on its own. After a short break, we got back in the air to begin my grid practice. The grid that we had picked out covered a hilly area on the west side of Beluga Mountain and the lower flat areas on the north side of a small creek. Referencing my GPS coordinates, I flew to the corner of the grid, and began sweeping back and forth along the area, while trying to maintain a consistent ground track, speed and altitude. It turned into a real challenge when I realized that I was being blown sideways by a steady crosswind. I could see how much I had drifted by checking the longitude on the GPS, and so for the next few passes, I worked to compensate with an appropriate crab angle, while referencing features in the landscape off in the distance. Along with the wind, the uneven rising landscape, and the fact that I was in completely unfamiliar terrain, where the directions of north and south were not recognizable to me, it actually became a solid mental exercise. I began to realize why a Mission Pilot needs to be on top of his or her game. After a few more passes in the grid, we turned and headed back to Anchorage, where the weather was slowly creeping in over the Chugach. Along the way, I thought about how this one flight and exercise had just made me a better pilot. 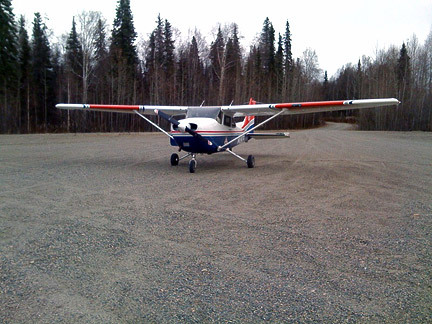 This entry was posted in cross country, General Aviation and tagged Alaska, Cessna 172S, cross country, Skwentna. Bookmark the permalink.